Avella brought me in as their creative director during a rebrand. 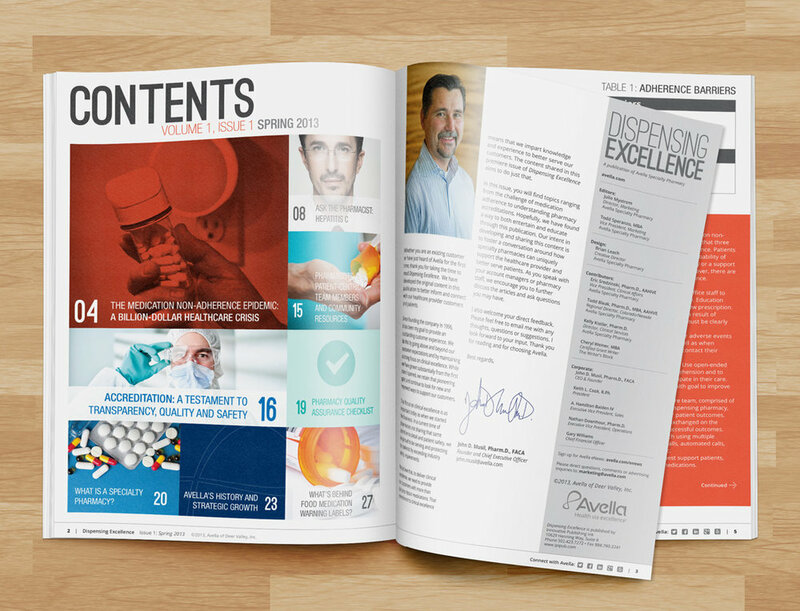 After the rebrand, Avella needed to maintain and mature creative and marketing communications. I helped establish the initial branding and visual design during the rebrand. Afterwards, I managed creative for our marketing department. I handled internal design projects, as well as providing direction for our agencies and freelancers. 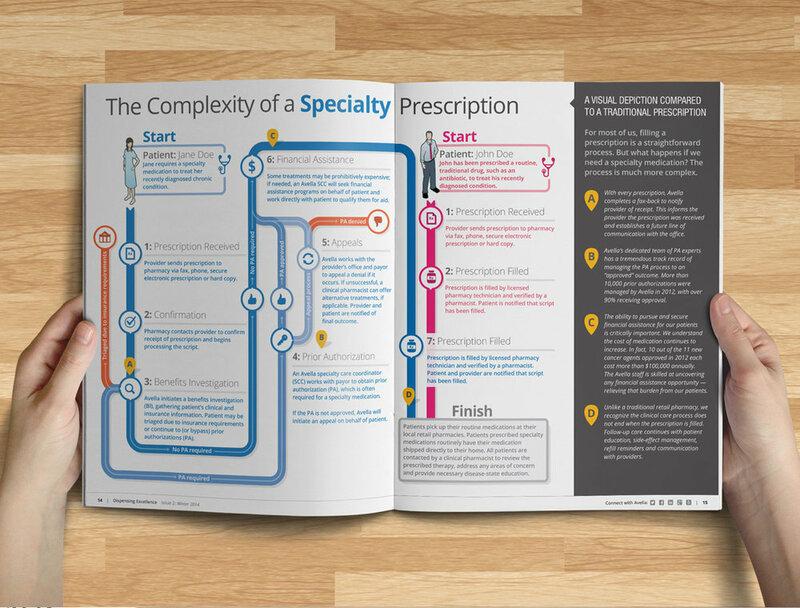 We later began creating digital products for our users (patients or healthcare providers) and I helped guide those UX and UI efforts. We contracted with an agency to create some of our necessary brand "basics" – logo, tagline, and website. As part of our marketing team, I extended those basics to our other brand touchpoints. Our initial brand "lift" was to create evergreen content that we could parcel out for different channels. 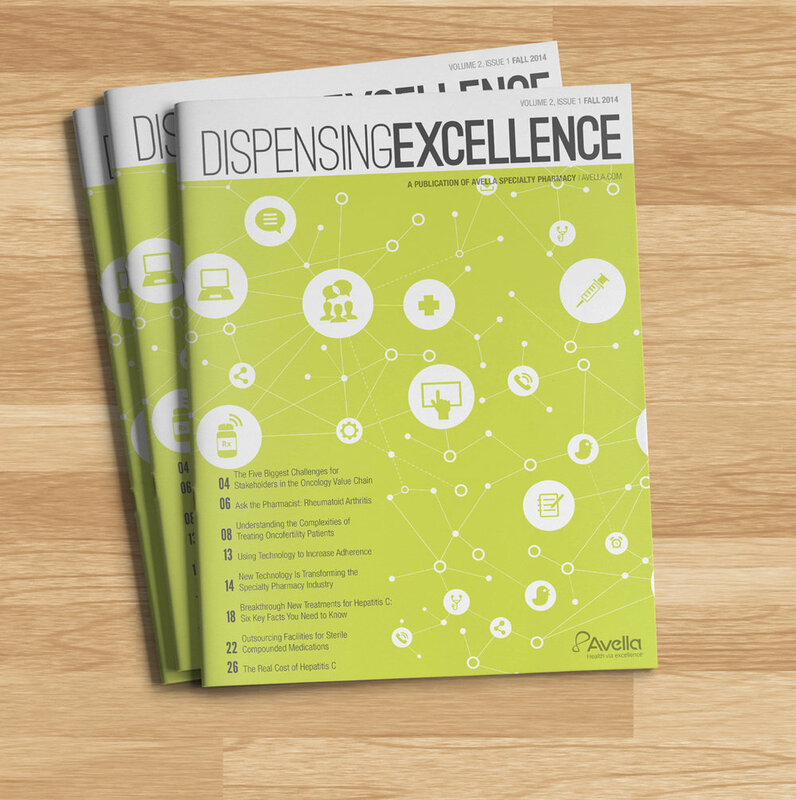 The centerpiece of those efforts was a publication titled Dispensing Excellence. We repurposed content from the publication to social, white papers, sales support, web, RFPs other channels. 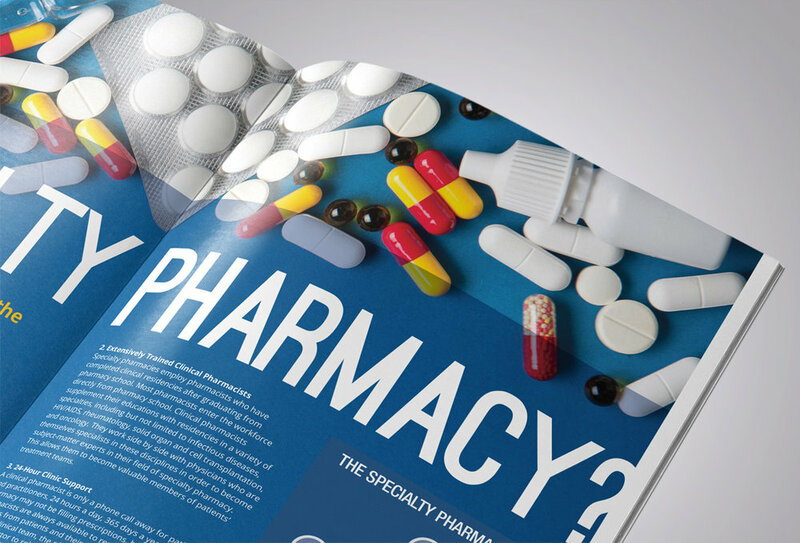 Internal personas targeted included sales staff, pharmacists and call center support. 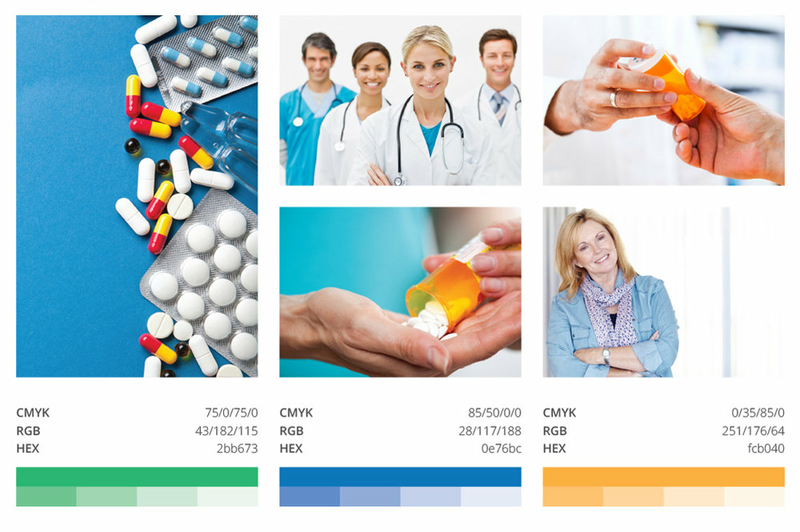 We also varied the content for external personas: patients, healthcare providers and pharmaceutical manufacturers. 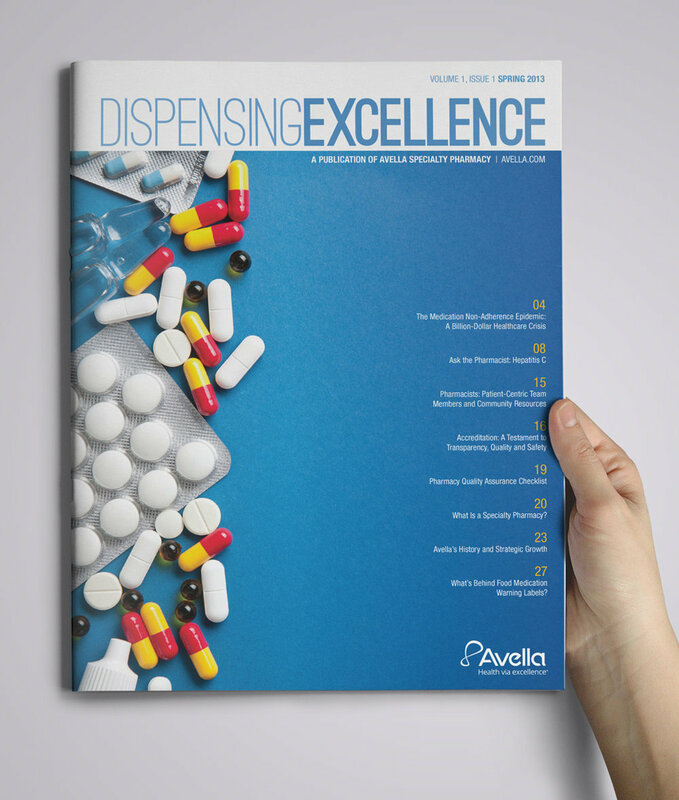 Dispensing Excellence leveraged our brand promise (clinical excellence) and set the tone for most of our design efforts throughout my tenure at Avella. 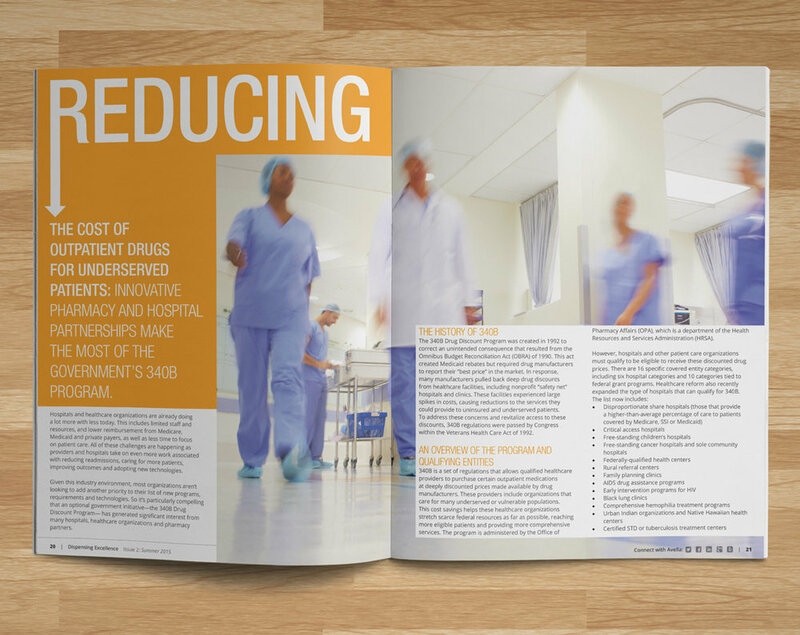 An area many of our patients struggled with was medication adherence. For a variety of reasons, patients don't always take their prescribed medications (this is termed "adherence"). 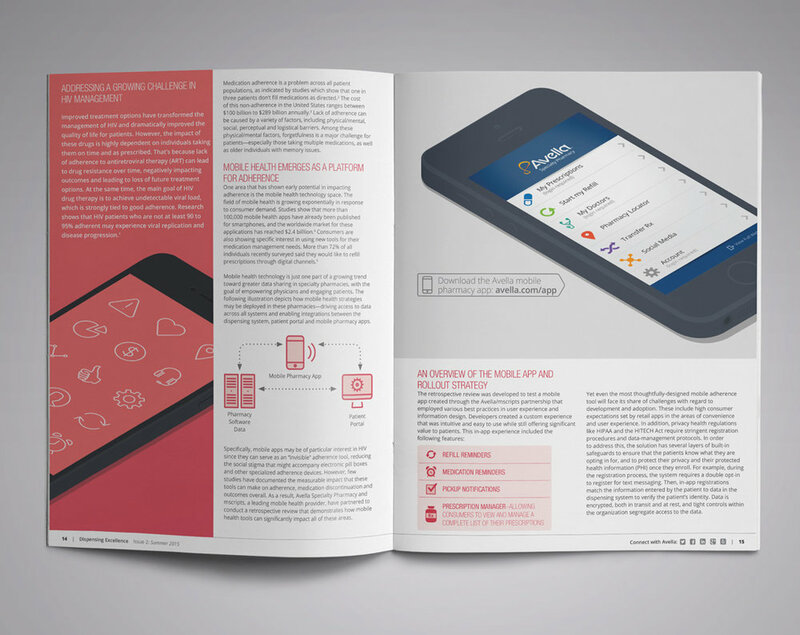 Unlike traditional pharmacies, which are largely an e-commerce experience, we decided to develop an app that was focused on helping our patients be adherent to their medication regimens. We had a developer in place whose expertise was in connecting back-end pharmacy systems and white-labeling pharmacy apps. Our app was their first foray into customizing the experience based on the patient's needs. 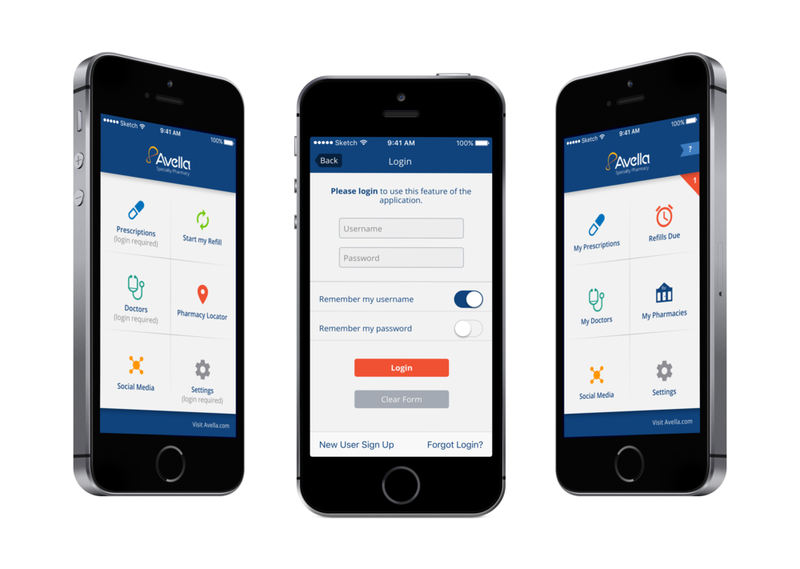 I provided UX direction to our developers when Avella decided to build a pharmacy app. We launched the app during the transition from iOS 6 to 7. Key features of the application were detailed prescription information and (more importantly) a system of reminders to patients. Systems like this are relatively commonplace with traditional retail pharmacies. 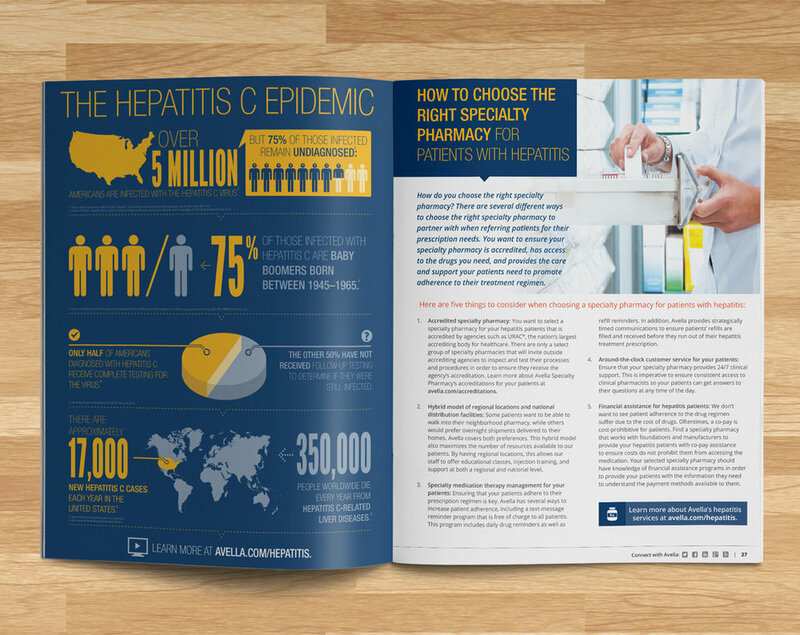 The crucial differentiator for Avella is their patient cohort: typical Avella patients are dealing with chronic, life-threatening disease states (such as HIV, Hepatitis or cancer). They aren't served (at least not very well) by the standard corner pharmacy. I created the screens for our initial mobile app launch. At the time, we were bolting new functionality on to an existing (largely templated) system, so our first launch included features for refill reminders and medication information, as well as doctor and pharmacy information. For Avella, metrics of success were centered around patient adherence rates. Especially given the conditions most of Avella's patients face, medication adherence could have significant health impacts. Given our brand promise (clinical excellence), we decided the most valuable metric we could test on were patient adherence rates. Avella conducted a clinical study on a cohort of HIV patients to test adherence rates for app users (vs. those who were not). Read more about the study and results. Among other findings, the study revealed that Avella's patients were 49% more likely to achieve viral suppression than the national HIV population. The upshot is that development and deployment of the mobile app had a significant health impact to those patients who used it. While this may be indicative of a patient population that was already more engaged with their health outcomes, even among all tested Avella patients, those who used the app were more likely to achieve viral suppression. I also began mocking up designs for a healthcare provider web portal, which would provide similar information (prescription status) to providers who prescribed to Avella. Healthcare providers would need ways to visualize prescription data in both aggregate and individual cases. The initial concepts here would address the key (MVP) feature set: patient-level details, and a healthcare provider dashboard. 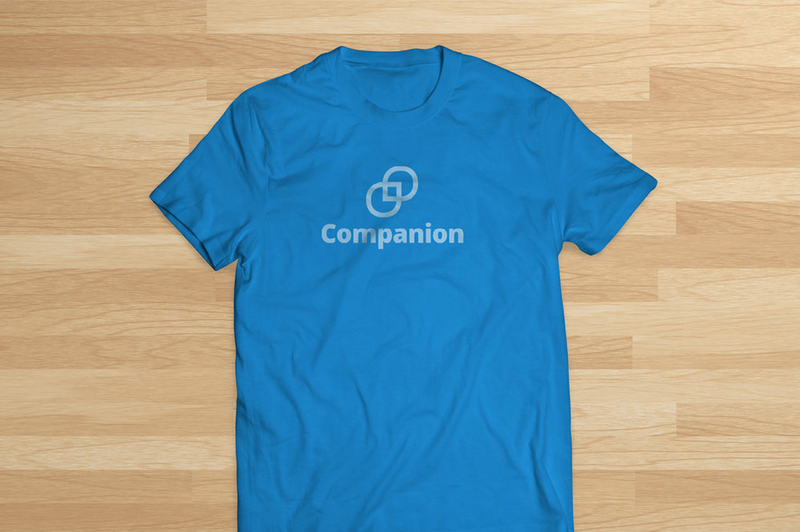 I later took on a branding effort for "Companion", an internal software tool, literally interpreted as a partner or link for the pharmacy to manage patient information, and additionally serve as the connection between the pharmacy, patients and their doctors. There was already an established user base and some brand recognition associated with the tool. We undertook a comprehensive effort to brand the software, with an eye towards white labeling it at some point in the future.